I imagine that if you live in the lightning capital of the world, itS unavoidable. Sooner or later the boat will be hit by lightning. However, usually it occurs when no one is on board. I should be so lucky. In our case, we had a front row seat as we were hit by lightning on what began as a perfect sailing afternoon. Southwinds, a sailing magazine, recently featured an article on lightning strikes and boats in their June 2009 issue, and mentioned my experience in their story. Afternoon storms are as regular as clockwork in summer months in central Florida. For that reason I usually leave the dock just as offshore winds are building in mid morning and try and be back in our slip before the storms hit. One Saturday, household chores delayed the departure and I didn't motor out of the marina until almost noon. Inevitably clouds began building a couple of hours later, and unfortunately for us, a monster storm cell formed just offshore of Cape Canaveral, FL. I watched it build into rolling jet black clouds and it wasn't long after that lightning bolts could be seen hitting the water all around the perimeter of the storm cell. What was even worse was it was heading our way. I gave up trying to avoid the storm and immediately shortened sail. Within 15 minutes wind gusts were at 25 -30 knots, and the clouds black as night. I made the decision to strike the sails, and battened everything down, started the twin diesels and put our bow into the wind. We waited, which was the hardest part as lightning strikes were increasing as the storm cell came closer and we watch this macabre show come closer and closer as the thunder claps became deafening. It wasn't long before the full fury of this storm cell hit Catalpa. Winds gusted to 60 knots with driving rain that hit with the force of hail. I don't have a windscreen on Catalpa and found it near impossible to keep my head up. It was more comfortable for me to duck down behind the helm bulkhead and let the wind and rain roar over my head. Lightning bolts were hitting the water all around us by this time. It was like we sailed into an artillery barrage with the bright lightning strikes followed immediately by that deafening clap of thunder happening about once every 2 seconds as this violent storm cell seemed to swallow the boat. The Admiral was in the saloon until a close miss made her head for me in the cockpit. We were about ten minutes into this when there was a very loud crack. When this bang occurred I had my head down avoiding horizontal rain ... I heard it, but didn't see it. . I looked up just in time to see our masthead tricolor light hit the water 25 feet off the starboard stern followed by a shower of melted masthead fittings hitting both of us in the head and arms. I immediately realized what had happened. We had been struck by lightning and we were still alive. I looked up and couldn't believe what I saw. 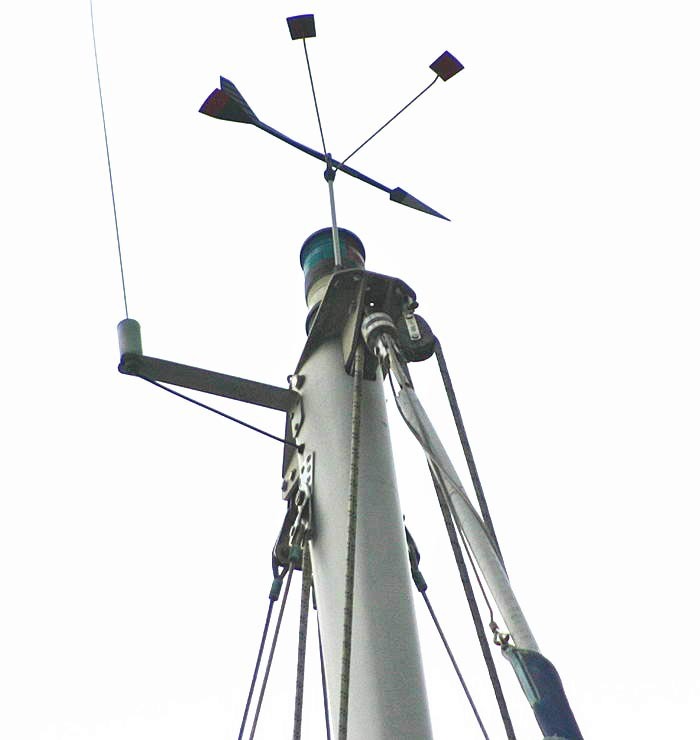 Everything on top of my mast had been blown off the boat. My masthead was clean. I didn't think it possible but the wind was growing even stronger. With boat engines at max RPM, Catalpa was no longer making headway and in fact, according to the handheld GPS, was being pushed backward. There was no choice but to put the helm over and run with the storm while picking bits and pieces of mast fittings of our hair at the same time. So much for my storm boat management technique. This is exactly what I had been taught not to do, but there were no other options. We hung on for dear life, and eventually the fury of the storm decreased as the storm cell moved away. The admiral had been holding on to me so tight she left marks which took a while to fade. When I finally managed to stand up without the wind blowing me over I immediately checked the boat for damage. Thankfully, a quick check showed we were seaworthy.... The engines were still running and we weren't taking on water. In this case we dodged a bullet as the storm moved on within 30 minutes leaving us to reflect on our good fortune. I set our course back towards the marina. What is interesting is what wasn't damaged. Two cell phones we had on the saloon table were unaffected as was a Canon Digital Rebel camera and a hand held GPS. Each item was operating at the time. In other words, anything that was connected to the boatS DC wiring was fried and anything portable was unaffected. Keep this in mind when you think you need to install expensive electronics. I'm devising a method of disconnecting valuable equipment should this situation arise again. Apparently if its not connected to DC wiring, you have a good chance the equipment will survive a lightning strike. All of this was accomplished in just one afternoon. I'm now a huge fan of tabernacles and deck stepped masts in general. 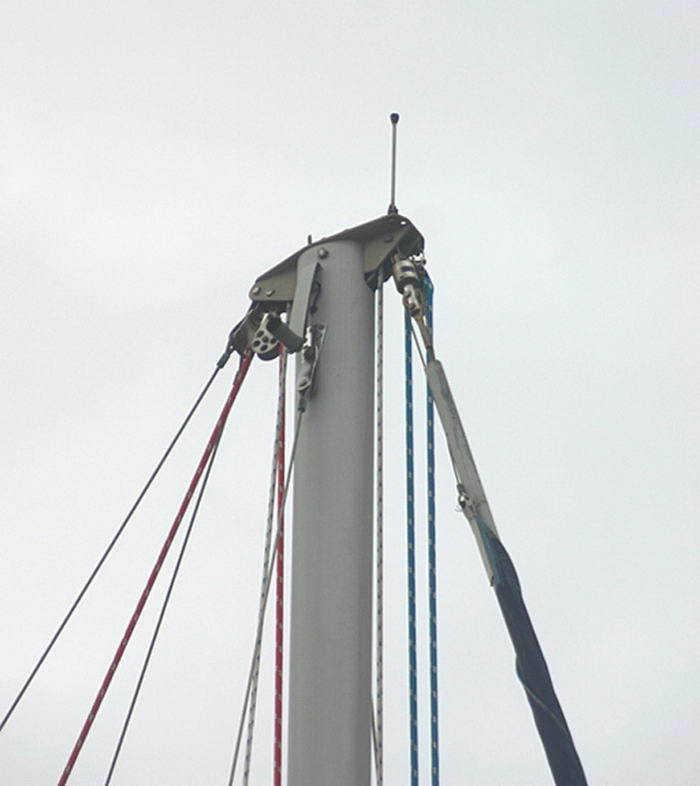 We were able to lower the mast onto solid ground which allowed the mast repairs to proceed quickly and safely. There is a controversy on installing lightning protection systems on boats. I have none, Lightning entered the boat upon striking the top of my mast and seemed to follow the boats DC wiring before exiting the boat through the propeller shafts of the twin diesel inboard engines. Neither of us even felt so much as a tingle of electricity even though we were barefoot and soaking wet. As for the other equipment lost? As of this writing, most has been replaced. I actually improved the radio situation. Look at the radio marine electronics cabinet page to see what I came up with. As you can imagine, this was an expensive lesson but at least we are safe and the boat is brand new from mast tip to deck. I have to wonder what the outcome would have been had Catalpa been equipped with new diesel engines with electronic engine controls. I'm certain the electronics would have been fried along with everything else connected to 12 volts DC. But would the engines still run? Also this completely ended an idea I had in the back of my mind for sometime about going with a total electric drive. Electronic Drive Controllers would have been toasted crispy and at a minimum, that would have been an even more expensive afternoon. As an aside.... we no longer sail on sunny summer afternoons in Florida.